The revival of the church seems to be closely connected with the condition of its ministry. 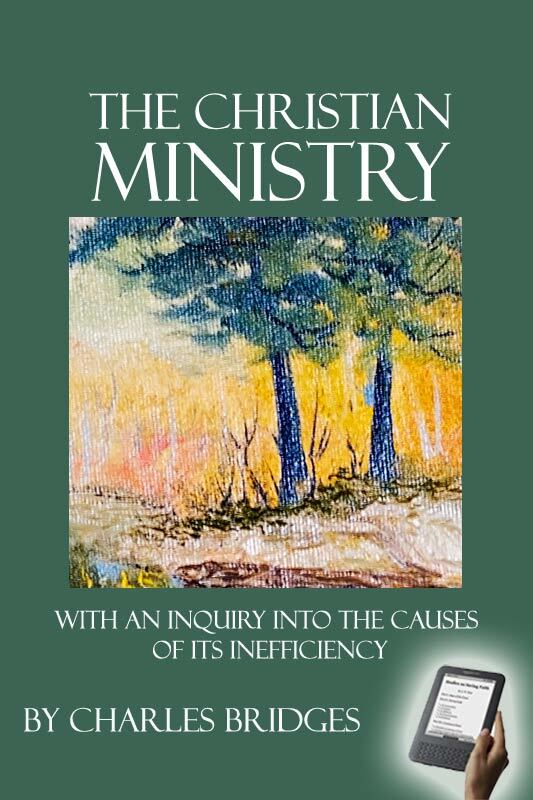 In this book Charles Bridges considers the general and personal causes of ministerial ineffectiveness, and goes on to examine preaching and pastoral work. Charles Bridges (1794-1869) was one of the leaders of the Evangelical party in the Church of England in the last century. He was vicar of Old Newton, Suffolk. As usual, Banner of Truth is faithful to the original in its rendering of this classic. 390 pages. Bridges divides his work into 5 parts: 1) The General view of the Christian’s Ministry (which covers such topics as the Divine Origin and Institution of the Christian Ministry, Qualifications of the Ministry, and Preparation for the Ministry) 2) General Causes of the Want of Success in the Christian Ministry (which covers topics such as The power of Satan a main hindrance to Ministerial Success and the want of a Divine call a main cause of failure in the Christian Ministry), 3) Causes of Ministerial Insufficiency connected with our Personal Character, 4) The Publick Work of the Christian Ministry, and 5) The Pastoral Work of the Christian Ministry (Here he discusses cases in the work of Pastoral ministry like “the infidel” and “the young Christian). Charles Bridges (1794-1869) was one of the leaders of the Evangelical party in the Church of England in the nineteenth century. He was the vicar of Old Newton, Suffolk, from 1823 to 1849, and later of Weymouth and Hinton Martell in Dorset. Although The Christian Ministry is Bridges’ best-known literary work, his expositions, which include Ecclesiastes, Psalm 119, and Proverbs, are highly valued.